I have the best customers on the planet! 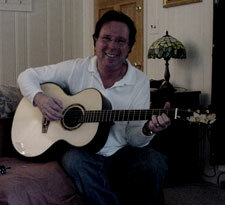 I took my new Everett just to show off but rehearsal ended early and I had time to sit in the corner and play it. came over and said "I can't believe that little guitar projects like that. I could hear it on the other side of the room. I sounded like it was coming out of the system." I was actually trying to play softly so not to bother anyone. he has 2 Everett Guitar hats. with Vincent's new Everett . Bryan withhis new Everett Petite. We had a lot of fun. Thanks Bryan. "To me, a big part of the experience was getting to make a new friend. It's really obvious that you care a lot about the guitar and the people. 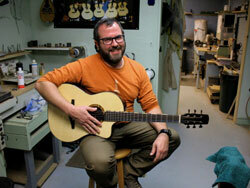 It feels very personal, and I don't think there are many luthiers who would put in that kind of heart." 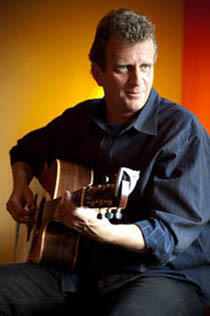 Jonathan Wareham's Ted Talk featuring his Everett Guitar. Truly, its balanced sound and clarity of articulation are nearly unmatched! has his first Everett on his knee. took out the Everett and played. Mark, that made my day. Thanks. her house was on fire. Ben sent this kind note in 2015. Debbie got Larry's second Everett (Catalina) for Christmas. Wahooo! What a Christmas gift. That is a happy Moody Christmas tree. 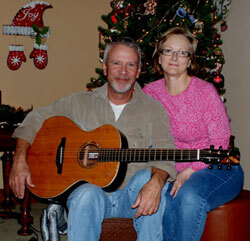 Kathy Johnson's husband Jeff came and took a 6 day guitar building class and went home with an Everett for his wife. I think all three of us are feeling lucky! 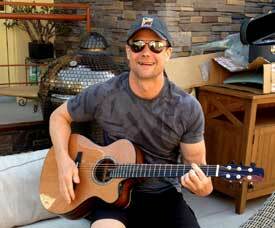 Eric Norman has a new favorite guitar. (Everett Sofia) Thanks Eric. The music is wonderufl! 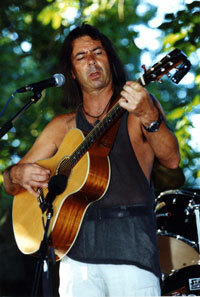 My long time friend Don Conoscenti in concert. 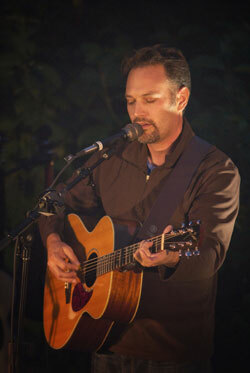 photo by Melissa Bugg www.donconoscenti.com. This is Don's fourth Everett , and who knows how many awards and contests this guy has won? How many capos can you spot? Big Daddy in 'command central' of the Juggernaut Jug Band. Yes they do have a wash-tub bass, and yes they are really good. Be sure to keep an eye open for these guys in concert. Chuck loved his Laurel so much that he ordered an Elan. 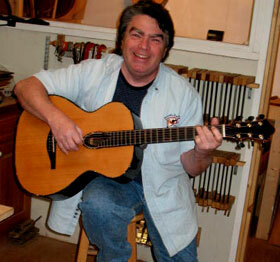 His Elan is featured in the 'construction / completed' section and shows off a little inlay that he cut himself. Tim visiting the new shop. Tim helps with this webpage and had me build him a big A.C. model a few years ago. 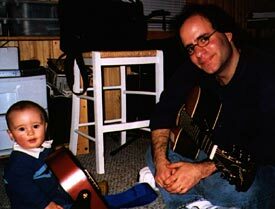 He plays a beautiful DADGAD Celtic style on his little Everett. 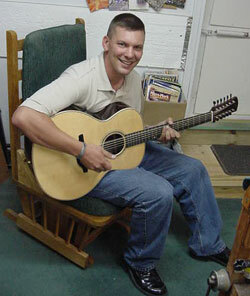 Of course, Tim is a "guitar nut" like the rest of us. 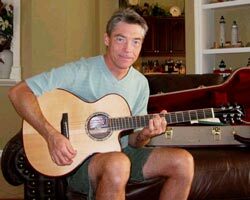 Check out his web page: WoodSong. Kevin and Kyle in concert. Photos of Kevin's Elan are at the gallery section. It was so much fun building his guitar! Today he is in concert with his son Kyle. 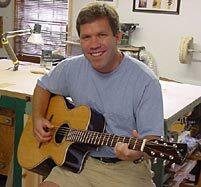 Looks like Kyle is also holding a 'fine handmade' guitar. Jeff and Rhonda visiting the shop. 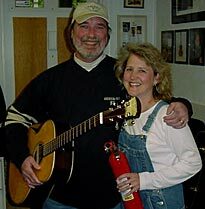 Hot guitar player + pretty wife + smokin' guitar = fire extinguisher. Leon, with his O model, visiting the shop. I have known Leon for a million years. This is his 5th Everett. Thanks, thanks, thanks, thanks, and thanks. 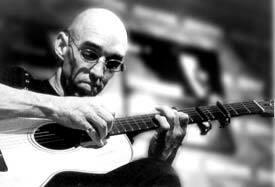 If Richard Thompson had a car crash with Fiona Richie, somehow Leon would come to mind. I have a ton of respect for anyone who can make a living playing music. Another Everett on order! Thanks Hank! Scott played and played and just could not say "no". Kind of like the puppy at the dog-pound that comes up to you and hops in your lap. What are you gonna do? 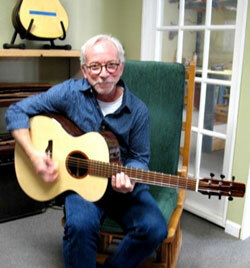 Chris Everett (singer / songwriter) got his Everett when he visited the U.S. a few years ago. He took the name 'Everett' as his stage name. 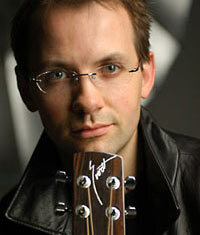 So, he is not related other than being related to all of us with the love of killer acoustic music. 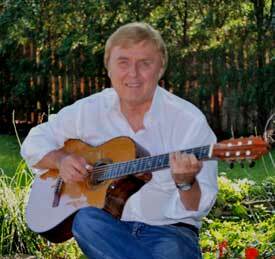 Be sure to check out his website and hear him in concert when in Germany. 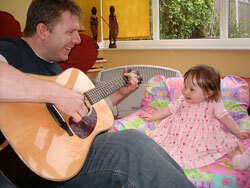 Carys has been listening to Chris play his Everett since the 'start of time'. What fun! Thanks Chris. "Thanks you so much for making the deal happen with my dad. It has taken a good 3 1/2 years of begging in order to finally get "an Everett." Honestly, I am more impressed and pleased than I ever thought I would be." 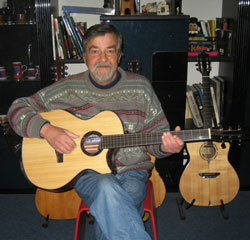 This is Darrell Jennings with # 1 of only 3 of the 30th Anniversary Everetts. (He is a killer photographer too!). 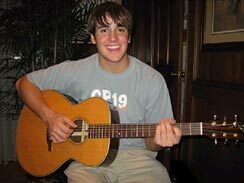 He drove down to Atlanta to get his guitar. We had a blast! 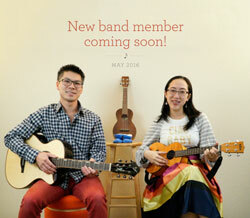 and we built a guitar. 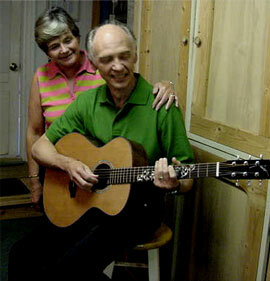 worked on this guitar, and later came back to pickup his Azaela Everett. Well the Ever-etts keep spanning the Globe. Hardy found his Everett in cyberspace. 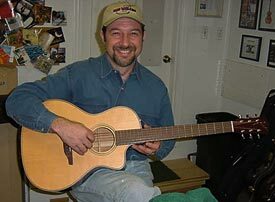 guitar building class from me. What a great guitar player. But that is only part of Jason's story. This is one interesting guy. Catch him in concert when you can. 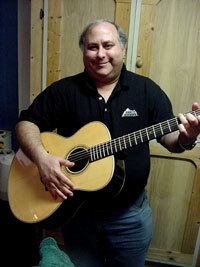 Well Dan scored the last 2 Laurel 12 string for his studio Range Entertainment. 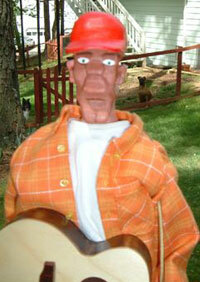 He also has a custom built Everett with his favorite dog Maggie inlaid on the peghead. From Russia with a big smile. Anton Anokin sends us a photo of our first Everett in Russia. Thanks Anton, it looks like this Everett has found a good home! Yep, Mark Kunkle has a halo. got his first new one. That qualifies for a halo, no? 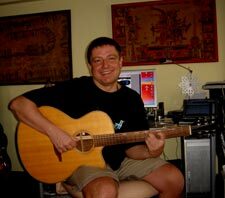 Well, Tony Rose bought a couple of my guitars a million years ago at the CAAS conferences that I used to attend (Chet Atkins Appreciation Society). 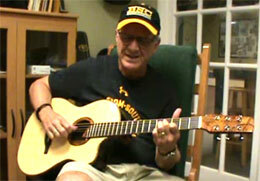 Michele Glisson got this guitar for husband Bob for his 50th. 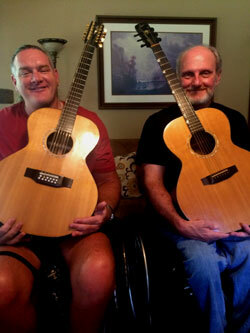 "He was absolutely floored to get this guitar. He plays it almost everyday and just really loves it. " Well, that's my kind of birthday! (Yep, there are two dogs there.). 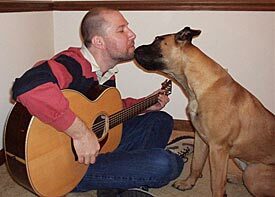 A dog lover like me, Craig has supplied my shop with wonderful acoustic music for years. It is really an astonishing guitar. Perfect sound and perfect handling just as esp. made for me. The Metrocaster is probably the best sounding guitar I had. little by little those little treasures you built in. 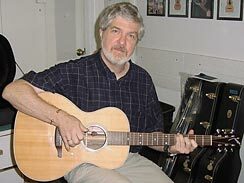 The instrument is extremely good balanced - no bases no middle- or hightones prevail or are dominating the sound pattern. Hoots was designed by my buddy puppeteer Chuck Robinson. Of course Hoots is playing an Everett , just like one of Chuck's two Everetts. out on my board?? " 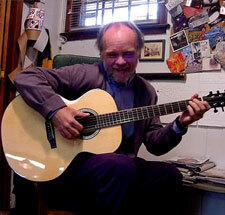 Please visit his great acoustic guitar shop. Classic /Electric. 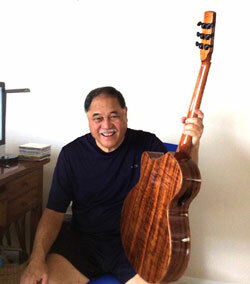 We had fun designing and building Ed's guitar. I say "we" because he had a lot of input into it's design.
" Everything is perfect on this guitar and I will have you know that the "soul" of the High Breed is and has consistently remained ever-present and ever increasing each time I play it. The action workmanship and attention to detail still holds true-to-form since the day that I purchased from you back in 2005." Greg Davidson is a magician. He is fun. 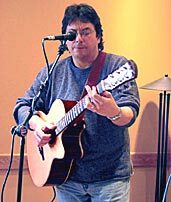 And he is one of those guitar players that keeps telling you he is not any good while he plays something wonderful on the guitar. 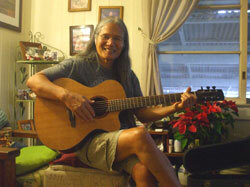 Be sure to check-out what he and his lovely wife (Jane Riley) do with their talents. Eric Sutter with his new Everett Alienzo. 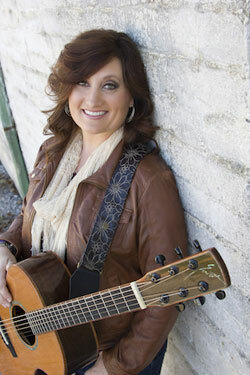 "I've been playing the guitar every day, and it's the best thing I've ever had my hands on. 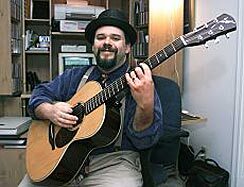 My brother has played for many years at clubs in Seattle and L.A., and he said he's never heard a sound that nice from an acoustic before. a dream come true! " "Hi, Been a while. I'm sure you remember that night over 20+ years ago when Pat Buchanan sold me that guitar to give my best friend Jay at that Night club. How you showed up and surprised us both with the story of the guitar and how the Indigo Girls were supposed to have it. And how there is a sister 12 string. For my 50th Birthday last year he attempted to contact Amy and see if she still had it. A year and a half passed so he gave up when out of nowhere Amy Ray E-mailed. 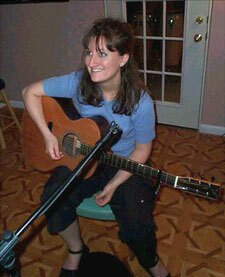 She still had the guitar but rarely plays 12's anymore. She wrote since we knew the importance of Everett Guitars and we had the sister guitar that she would sell it to us, after all, it deserves to be played. So the story is full circle and we have #44 and #45. I learned how to play on a 12 string and couldn't be happier! 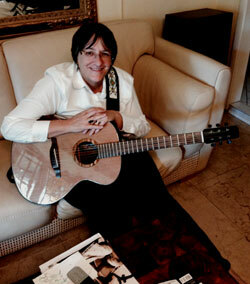 The guitar has been around the world, played thousands of shows and found a gracious new home. Jay plays his every day still and I can't put my Everett down. " Do I have the nicest customers or what! The best customers on the Planet! Let's add your link. More photos coming. 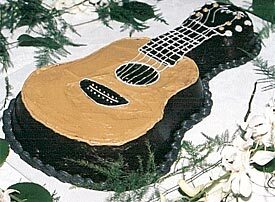 Kent, I got married a month ago and wanted you to see my 'Groom's Cake'. It's a copy of my Everett ... Anyway, I thought you might get a kick out of this." I've had my (other guitar) for over 15 years, and over that time it has opened up very nicely. But it doesn't even hold a candle to my brand new Everett! 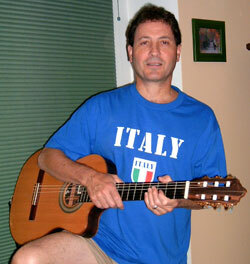 When I strum the (other guitar), I hear 6 notes. When I strum your guitar, it's like there's a whole choir behind every string. I can't even begin to imagine what this guitar will sound like in 10 years. 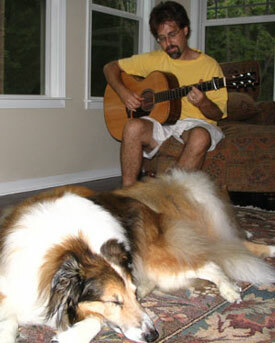 While I was playing the guitar, I unfortunately had some stomach discomfort - it began to turn and rumble down there. I stopped playing to go to the bathroom and realized that my stomach was fine. The rumbling was the reverberation of the guitar! What an amazing instrument. I'm just beginning to get to know it, and I'm excited about the journey ahead! played before I put it away."